Season one of Wayward Pines is winding down. With only a couple of episodes left there is a lot to wrap up. I have a feeling there will be at least one more big secret revealed in the last two episodes. 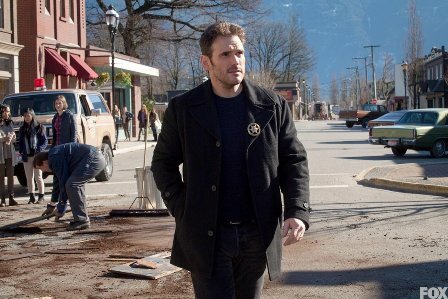 I love that the tables have turned and Ethan (Matt Dillon) really has become the new Sheriff Pope. What remains to be seen now is if he can hold things together and save the town. What were the best and worst things about this week’s episode “The Friendliest Place on Earth?” Read on to find out! Mrs. Fisher’s total dedication to Wayward Pines: It’s so over the top, but it works. 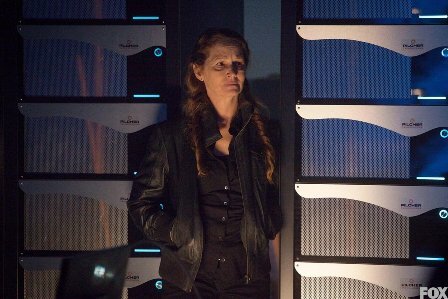 Fisher’s (Hope Davis) dedication to ensuring the future of the human race is unwavering, even more so than Pilcher himself it seems like. Fisher is the hidden villain of the show. It’s easy to forget about her until she shows up to mess with people’s minds. 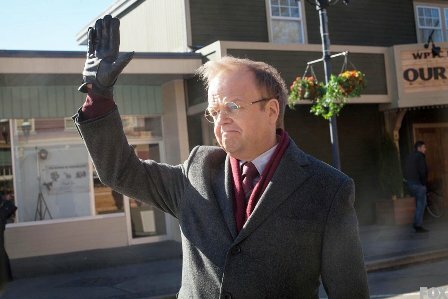 ”The Friendliest Place on Earth”: Who did Pilcher (Toby Jones) think he was fooling with the street festival? He can’t be naïve enough to believe that’s all the people need to make them feel better. Ethan (Matt Dillon) rightly shut it down, but I did like the strained look on people’s faces as they pretended to enjoy themselves. Theresa tells off Mrs. Fisher: It’s nice to see Theresa (Shannyn Sossamon) has a little bit more of a backbone than I had thought. The inquisition: So Nurse Pam (Melissa Leo) has a heart after all. The wall comes down: One of the insurgents breaks through the gate only to be immediately devoured by abbies. It certainly seems that everything Pilcher has said is true. They are in the future and the world is populated by “evolved” humans. This reminds me of H.G. Wells’ The Time Machine where the future of the human intellect ends up in the wrong direction. The overly obvious foreshadowing of Amy not being okay: They totally projected that Amy’s (Sarah Jeffery)injuries are much more severe than anyone thought.